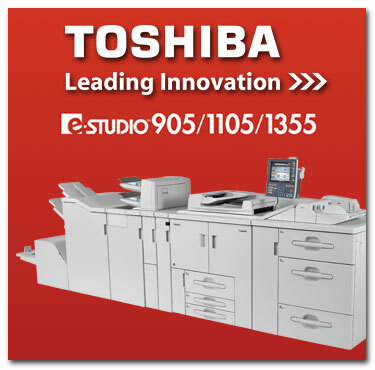 Shop around and compare—you’ll find the e-STUDIO905/1105/1355 deliver the highest copying speeds available on the market today. They also offer some of the most flexible finishing options around, not to mention an impressive 8,050-sheet maximum paper capacity from up to seven paper sources. Whether you’re a busy Departmental Office user, a Print-on-Demand customer or a Start-up Production environment, your company will work better, faster and smarter when you’ve got the e-STUDIO905/1105/1355 working hard for you.